Karachi, May 10, 2018: Procter & Gamble (P&G) announced the launch of its latest Gender Equality initiative under the P&G #WeSeeEqual program at a formal ceremony held in Karachi, reinforcing its commitment to contribute towards the economic empowerment of women in the country. Through its social cause programs, P&G has partnered with Health Oriented Preventive Education (HOPE) and UN Women for women's skill development and girls' education. 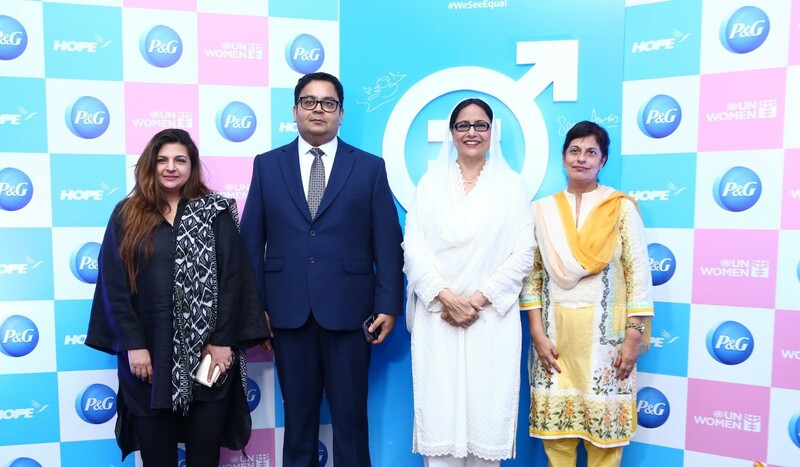 Sami Ahmed, Vice President P&G Pakistan (2nd left), Senator Khush Bakht Shujat (2nd right), Dr. Mubina Agboatwalla, Chairperson HOPE (1st right), Faria Salman, Head of Communications, Strategic Management & Partnerships Unit, UN Women (1st left) at the launch event of the P&G Gender Equality Initiative in Karachi. Speaking on the occasion, Sami Ahmed, Vice President P&G Pakistan, said, "We are pleased to continue our work to empower women in communities with the help of our partners HOPE and UN Women." He further added, "This is another step forward towards the fulfillment of our aspiration to build a world free from gender bias, and a world with equal representation and an equal voice for women and men, in our workplace, in our communities and in our country." Pakistan is currently ranked 143 (out of 144) on the World Economic Forum's Gender Gap Index and the overall literacy rate amongst girls in the country is 46%. P&G's commitment to Gender Equality is in line with the United Nations Sustainable Development Goal # 5 - to achieve gender equality and empower all women and girls. Senator Khush Bakht Shujat, one of the key speakers at the event, said, "Throughout time women have strived to achieve success in different fields of life. Much progress has been made in this area and so, today we have many inspirational examples of women leaders across the world and in Pakistan. However, we still have a long way to go." She added, "Education is vital and everyone deserves the right to receive a quality education. It is good to know that P&G, along with UN Women and HOPE, is creating educational and economic opportunities for women in Pakistan. This will go a long way in enabling women who play an integral role in the success of the nation." Also present on the occasion, Dr. Mubina Agboatwalla, Chairperson HOPE, was hopeful for the future. She said, "With the setup of these vocational and educational centers, many women and girls in areas such as Badin, Sujawal, Thatta, Gadap, Ghagger and Muzaffargarh will now have the chance to have to a brighter future." Faria Salman, Head of Communications, Strategic Management & Partnerships Unit, UN Women, also expressed her views, "UN Women Pakistan is committed to engaging with the private sector to drive change that advances women's equality and economic empowerment. P&G's Gender Equality Program echoes our call that the time is now to engage in collective actions to include and empower women in the world of work. We continue to count on the support of P&G Pakistan and call upon other private sector leaders in Pakistan to join this movement for a socially accountable and gender responsive private sector who thinks, acts and impacts gender equality in their companies, in the market place and in the community." P&G is committed to advancing its Gender Equality mission in the country. It is leveraging the strengths of its business operations as well as its scale and advertising voice to address gender bias, enable education for girls and promote women's economic empowerment. Gender diversity is an important aspect of P&G's overall diversity and inclusion mission. The Company aims to attract, recruit and retain the top talent in Pakistan with a special focus on women via a range of strong diversity programs. As a result, today women constitute around 42% of the employees at the P&G General Office in Karachi and 50% of the P&G Pakistan Leadership Team. P&G has joined the US-Pakistan Women's Council (USPWC) in its mission to promote the economic participation of women in the workforce in Pakistan. As the founding member of the USPWC's corporate initiative, P&G has played an active role in supporting the Council's efforts to promote supplier diversity in Pakistan. P&G has provided training sessions for 100 women entrepreneurs in collaboration with USPWC and WECREATE. The sessions aimed at, counselling women entrepreneurs about how to successfully enter the corporate supply chain and creating awareness about the procurement processes at corporate organizations. In partnership with Health Oriented Preventive Education (HOPE) and READ Foundation, P&G has provided quality education to over 3500 girls from underprivileged communities in Pakistan. Furthermore, P&G brands have been committed to empowering women and young girls with confidence in Pakistan through campaigns such as the Always #MyFutureStartsToday and Pantene #StrongIsBeautiful. Through the P&G Always #MyFutureStartsToday program, 30 girls won educational scholarships and 4 winners spent a day with role models Naseem Hameed and Amna Ilyas. The campaign reached out to around 12 million consumers. Moreover, the Always School Education Program has reached over 9 million Pakistani girls with essential health and hygiene education to date.